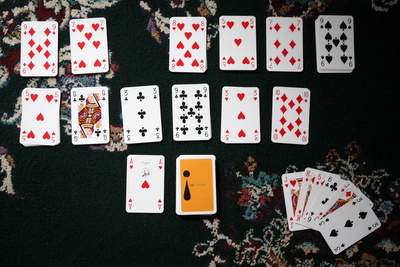 If you deal and Ace or a King, put one card in the draw pile. 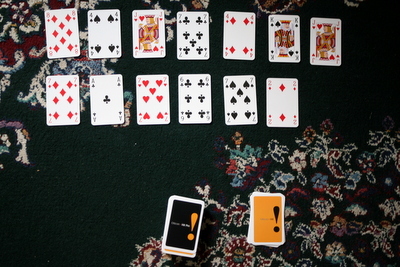 At positions 7 and King, put two cards in the draw pile. If you deal the same card as the card position, put one card in the draw pile. So if you were to deal a King in the King position, you’d get your two cards for the King position, another card for dealing a King, and another card for dealing a King into the King position (that particular deal satisfies all three of the above rules for a total of 4 cards). Now, the goal is to build up from suit-specific Aces on the left, and build down from suit-specific Kings on the right. 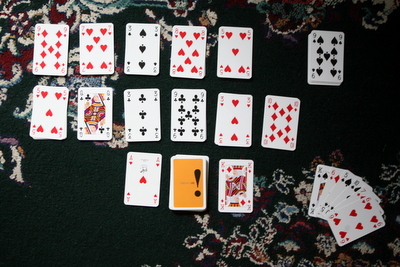 Any card that is on top of a card position pile may be played. So you’ll see in the picture above, I can pull the Ace of Hearts down, but there is no 2 of Hearts, and no other Aces or Kings, so I’ll need to draw a card from the draw pile. 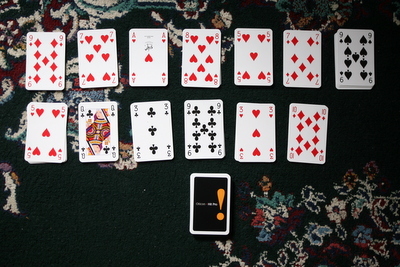 I drew a 3 of Spades, so I can pick up the cards in Position 3, and see if there is anything I can play. I see there is a King of Diamonds, but that’s it. So I replace the 3 pile (with the 3 of spades now on top), and draw another from the draw pile. Here I see the King of Spades. Nothing else usable yet. Skipping ahead… I’ve now got all my building piles. This time I drew the Jack of Spades, and in the Jack pile there are some usable cards that will allow me to use other cards on the board. 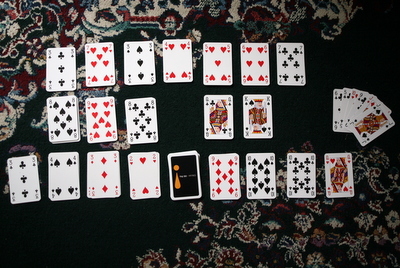 I can use the 9 of Clubs, then the 8 and 7 of Clubs from the board, etc, etc, etc. You get the picture. Just keep doing that until you’ve run out of cards in the draw pile. It’s actually pretty hard to win this game, but if you want to cheat, when you’ve run out of cards in the draw pile, go through and take the top card off of each of the position piles and make that your new draw pile. When I was a kid, I measured how well I was doing by how many times I had to cheat in order to win the game! Thanks, Granny, for teaching me your game, and special thanks to Lydia for reminding me of it!